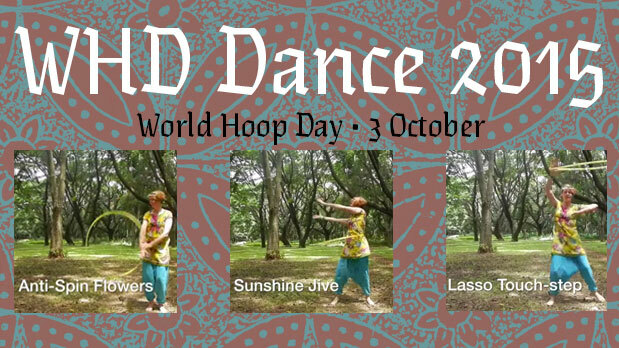 This year marks the 6th annual WHD Dance, a worldwide hoop choreography project to celebrate World Hoop Day. I never imagined it would go on this long – in fact last year, I swore to myself it would be my last one. But here we are, with the 2015 tutorials published and ready to learn. Each year the choreo gets a little more dance-y. This year we’ve got a Bollywood-inspired dance complete with sultry hip rotations, jaunty touch steps and stompy squats. The hoop moves focus on beginner-intermediate tricks that should be accessible to hoopers with a few months experience and who are willing to learn a few new things. I want to share some ideas on how to customise the dance for your troupe, your space, and your hooping level. The beginning section can be done standing (as filmed) or seated, rising to standing during the gestures. Weave Variations are any sort of weave you like – plain, jump-thru, weave isolations, extensions, etc. Keep them all the same for your troupe or let each dancer choose for themselves. The Mandala Variations section is filmed as a mandala turn, but this can be done with a regular b-t-b mandala or mandala isolation, or for people uncertain about behind-the-back moves, Big Circles in front will work, too. Tighten up the dance moves by focussing on the angle of your elbows, the distance of your vine steps, and so on. My dancing in the tutorials is pretty loosey-goosey, which is OK for a soloist but ugly in a group. Practice, practice, practice and get everyone consistent. LED hoops look great with this choreo. I included a few moves especially for glow hoopers. Fire? Yes! Light the hoop during the head roll to keep the static burn to a minimum & watch out for the fold/flip. Counting is optional if you listen to the beat of the music. Hit those beats and keep everyone in sync. Fun is not optional. Add your smiles and buoyant energy to make the dance really shine on stage. This year’s song is an edited version of Chaiyya Chaiyya from the movie Dil Se. It’s a love song inspired by a poem in Urdu that starts “He who walks in the shadow of love has heaven under his feet” and the repeated lyric Chaiyya Chaiyya means “Walk in the shade of love”. You can find the whole translation here.